EDIT (22/05/15): Updated post to reflect correct behaviour of no-lock when parallelising. Thanks @maustinjones. Please also refer to the follow up post -> https://dreamingincrm.com/2015/05/22/redux-retrievemultiple-on-large-datasets/ on why paging cookie is the recommended approach. EDIT (18/07/16): Please watch this -> https://www.youtube.com/watch?v=-N20I5mo7RU video from the Dynamics CRM product group, which goes into much more detail about performance techniques to optimise RetrieveMultiple queries. I have not included the paged RetrieveMultiple in this scenario, as it is too slow, and I am too impatient to wait for it to complete. leverage NoLock=true where possible to reduce database contention. So ideally, you should be using RetrieveMultiple method in ParallelProxy, to retrieve records from multiple entities. But, in my case I am retrieving from the same entity, hence I am using the no-lock option the fetchxml. DMed with @maustinjones, and here is an important point to consider, before choosing a technique. When you use TPL to submit a bunch of RetrieveMultiple requests in one go, there is a chance of encountering database lock issues, even though you use no-lock. So, it is OK to parallelise queries that fetch from different entities, but using PagingCookie is the recommended approach. To be honest, I did not experience any lock issues during the test, but standard CRM load was not simulated during the test. I am not sure what would have happened, if users were viewing contacts/running reports on contacts, and I am running these tests at the same time. Database contentention and locking is applicable only in scenarios, where no-lock is not feasible. TPL just blitzes the other techniques in these tests, but I’ll have to test this further to see if lock contention issues arise, in much larger datasets. Do consider PFE Xrm Core, if you are looking to use RetrieveMultiple from multiple entities. It is written by the PFE Dynamics guys and is open-source. This article in msdn is a must read if you are thinking of using TPL -> https://msdn.microsoft.com/en-us/library/dd997392%28v=vs.110%29.aspx. I had performance issues with TPL, as I had Console.WriteLine inside the lambda for ForEach, and it basically killed the performance. The article told me why, and so it is quite an useful read. I quickly wrote this just to test the performance, and not production quality in mind. If you read the code, you can see I am sending 20 requests at a time, inside an infinite loop to retrieve all the pages. I exit the loop when any one of the pages, returns no result. 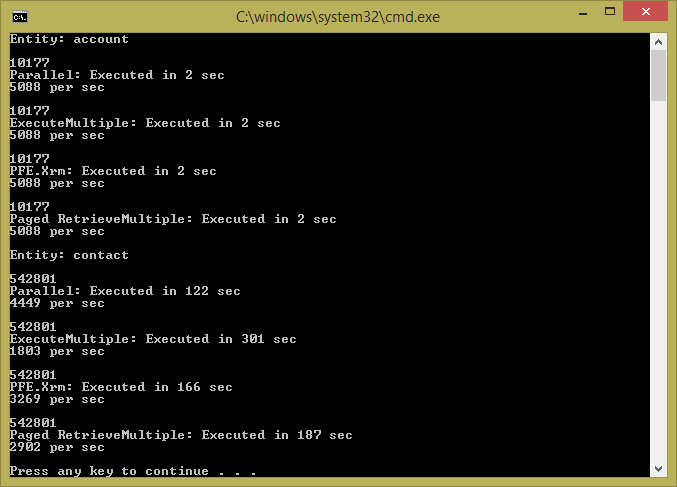 I haven’t tried ExecuteMultipleRequest inside the Parallel.ForEach. It would be interesting to see what the performance will be in that case. Code: Here is the code, I tested with, for reference. Working for CRM 2016 ? I haven’t explicitly tested this in crm2016, but it should.